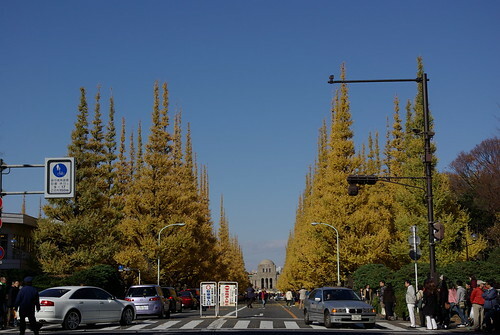 Ginkgo Trees, originally uploaded by mrhayata. 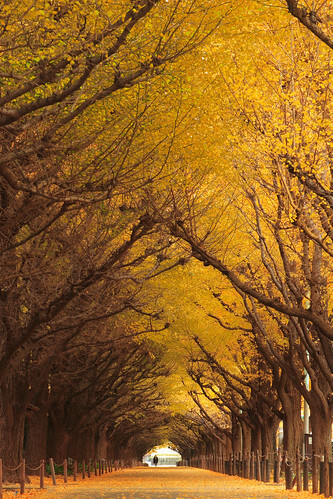 In Tokyo, near Aoyama there is a street that is lined with large Ginkgo trees. Both sides of the sidewalk on both sides of the street are lined with these magestic trees making for a total of four rows of trees. When the trees are in their full autumn colors it makes for a very dramatic and enchanting scene. ginkgo trees - at December 9, 2007, originally uploaded by naoK. travel, originally uploaded by Mori Chan.